In the late 1880s, steel had virtually replaced wood and stone as the primary load-carrying material in the erection of bridges and buildings. This abrupt change in structural materials brought about a demand for a new type of worker-bridge-men and architectural ironworkers. These Ironworkers became known as "cowboys in the sky." As these daring, young, independent men, eventually aged and became husbands and providers, their thoughts turned to providing for their families during sickness, injury, and death. With the realization that by joining together, their voices would become stronger, unified, and heard. 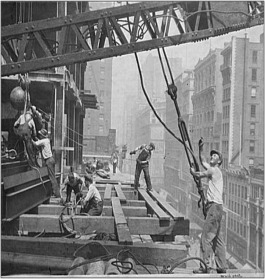 They established the International Association of Bridge and Structural Iron Workers of America on February 4, 1896.